Since 1986, Flow-Rite has been building Ready Rack (more commonly know as Redirack) Storage Solutions for customers in Toronto and southern Ontario. Whether you’re looking to rack a small retail operation or a large distribution centre, we have the Ready Rack solution for you. Using our extensive experience in multi-faceted warehouse racking systems, we will design a Ready Rack Solution that incorporates your requirements. From an initial product and warehouse appraisal, we analyse your product types, pallet criteria, material handling equipment, available warehouse space, current pallet racking systems and warehouse shelving. This deeper understanding of your business operation forms the foundation in designing a warehouse storage solution that maximises your warehouse capacity and operational needs. We stock a large selection of new and used Ready Rack that can be shipped quickly to your location. 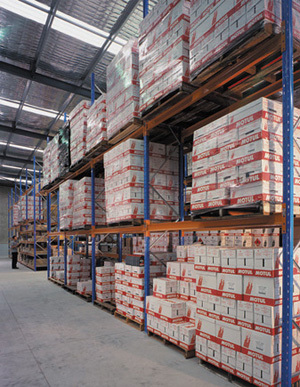 Flow-Rite can also provide customized storage solutions that meet the requirements of your business. For example, Ready Rack can easily be adapted or reconfigured into different storage system applications including Pallet Flow Racking, Push Back Pallet Racking and Drive-In Pallet Racking. Please call us today for a free quote or consultation.